I sent a package for a stationary swap to a girl in Spain. I'm not really into a big swap, but I enjoy small swap every once in a while. I hope she will like what I sent. 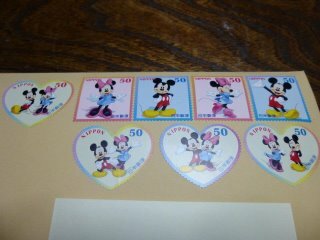 I put lots of Disney postage stamps on the envelope hoping she will enjoy them, too. :) They're one of my favorite stamps. Aren't they cute? Those are really cute! Reminds me a lot about my childhood!